Let’s Have A Party and Ob-La-Di Ob-La-Da Lead vocal recorded in California,USA,2008. 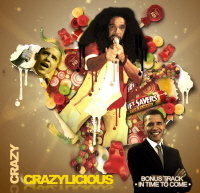 Recorded in Soca Rebels Studio Gothenburg, Sweden 2008. Body Talk Recorded in Soca Rebels Studio Gothenburg, Sweden 2008. Lead vocal recorded in Trinidad,2008.